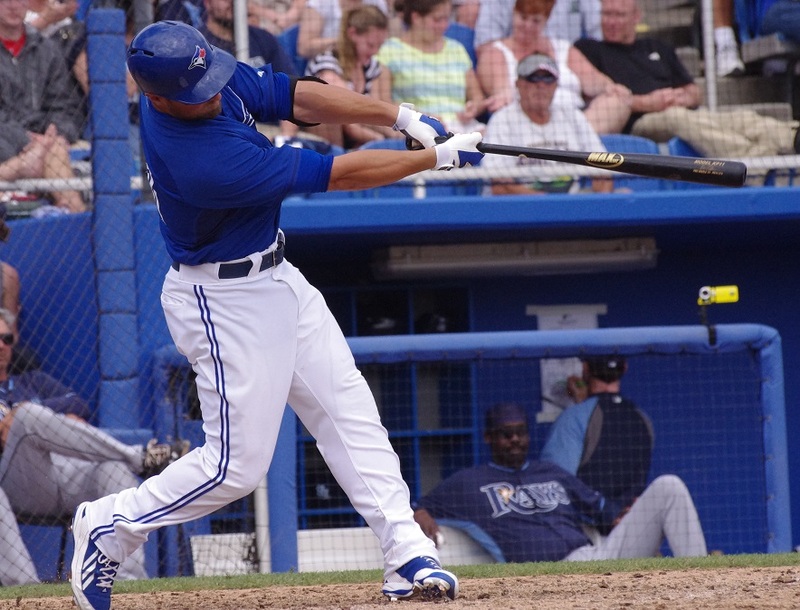 There were some wild games for the minor league teams as well as in Toronto on Wednesday. The Jays dropped a crazy 10-8 ballgame and there were also some great minor league performances too. For a different perspective, you can check out Jays Journal’s Minor League Report written by our own Shaun Doyle. Despite the eventual 5-0 score, starter Kyle Drabek gave the Buffalo Bisons 5 2/3 good innings. Drabek gave up two unearned runs on five hits and three walks but struck out four. Bobby Korecky stranded an inherited runner in the sixth and threw a perfect seventh (racking up two strikeouts along the way) but Chad Jenkins coughed up three runs in the eighth inning to finish the game. Kevin Pillar has made it above the .200 mark, going 3/4 with a double and is hitting .217 on the season. Dan Johnson had a particularly bad game, going 0/4 with four strikeouts. Aaron Sanchez wasn’t particularly sharp, giving up four runs (two earned) on five hits and three walks in four innings but the New Hampshire Fisher Cats were able to bring the bats and overcome the early deficit to prevail 7-5 over the New Britain Rock Cats. Richard Bleier was excellent in providing four strong innings of relief, allowing just a solo home run to cross the plate while Gregory Infante notched his fourth save of the season with a clean ninth. Andy Burns was the star on the offensive side of the ledger, going 2/3 with a double, a triple, two stolen bases, three runs scored and a walk. Andy Fermin, who, in limited playing time, is hitting .421, had another two hits, going 2/4 and scored twice. A.J. Jimenez went 1/3 and drove in a pair of runs. 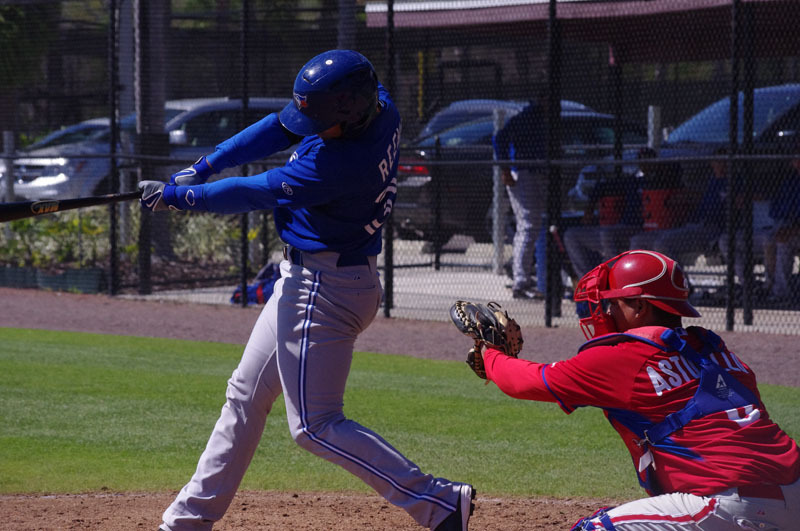 The Dunedin Blue Jays didn’t need much time to forget about their loss on Tuesday and punished the Lakeland Flying Tigers 12-4 on Wednesday. Leading the 15-hit assault (every position player had at least one hit) was Gustavo Pierre who is showing signs of life. Pierre went 3/5 with three singles. K.C. Hobson hit his second home run of the season, going 1/4 with two walks and Dwight Smith, Jr. and Matt Newman was also 1/4 with a pair of walks. Emilio Guerrero had another multi-hit game, going 2/6 with a double and two RBI and Dalton Pompey had a particularly big night, going 2/6 with a stolen base, three runs scored and his first home run of the season. Canadian Mike Reeves and second baseman Christian Lopes each had a pair of hits including a double. Reeves drove in three (also taking a walk) and Lopes drove in a pair. Similar to his first outing of the season, Jesse Hernandez gave up runs early but recovered and still gave the club six innings of solid pitching, allowing four runs on five hits and two walks with one strikeout. Danny Barnes, Efrain Nieves and Blake McFarland each followed with a scoreless inning of relief. The Lansing Lugnuts pulled off a walk-off win of their own tonight, winning their third straight game against the Lake County Captains 6-5. D.J. Davis was the hero, getting a base hit in the ninth with two outs, allowing Ian Parmley to score. Davis added a three-RBI triple in the third and an RBI ground out in the seventh to complete a 2/5 night with five RBI. 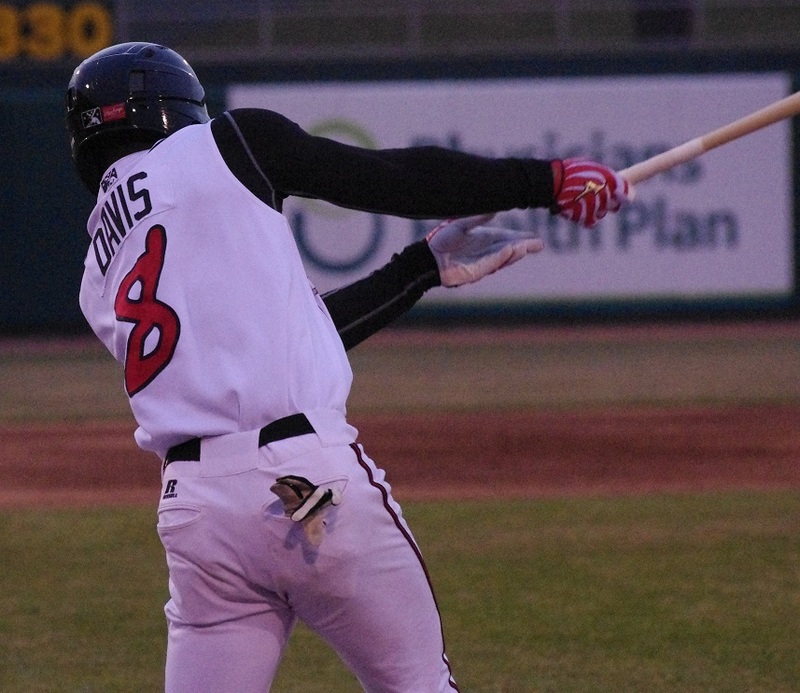 Justin Atkinson had another two hits for the Lugnuts. On the pitching side, Adonys Cardona was hit but certainly had his moments, going two and two-thirds innings and giving up four runs (three earned) on five hits and two walks but struck out five batters. Chase DeJong threw another three scoreless innings allowing two hits and three uncharacteristic walks but struck out three batters. Brady Dragmire gave the club two near-perfect innings of relief (he walked one and another batter reached on an error) and Scott Silverstein earned the win despite blowing the save and allowing a run in the top of the ninth. The Bisons send one of their best starters to the hill against the Scranton/Wilkes-Barre RailRiders, the top Yankees farm team. Liam Hendriks goes for Herd in a 6:35 start. The Aussie has made two starts (and two other appearances), posing a 1.13 ERA and has struck out 15 batters without allowing a walk in 16 innings. Despite having about 150 major league innings under his belt, he’s still only 25 and could be a solid depth arm for at least 2014. The Fisher Cats send Deck McGuire to the hill today against the New Britain Rock Cats. This game is on MiLB TV now (they’re holding the umpires meeting at home plate as I write this) and has McGuire pitching against Taylor Rogers who has been shelled to the tune of 19 runs (16 earned) in his 12 1/3 innings so far. Despite that ugly number of runs against, he has only walked two and struck out 15 on the season. McGuire has been very solid so far and is looking to put up another solid start for the ‘Cats. The tall Virginian has been harnessing his control with only three walks on the season and could easily put himself back in the equation on the long list of young pitching talent that the Jays have with a good season. We want to welcome Brian Van Kirk back to the Fisher Cats’ lineup. He returns from a 50-game suspension (after testing positive for a drug of abuse last season). I actually talked to his brother for quite a while during a spring training game last year in Tampa and we wish Van Kirk a great season in 2014. The Dunedin Blue Jays are rolling in their division and now they take on their neighbourhood rival Clearwater Threshers. The Threshers are 4-15 on the season and send 23-year-old Canadian lefty Ethan Stewart to the hill. Check out Alexis Brudnicki’s article on Stewart from spring training this season on the Canadian Baseball Network. Stewart has been excellent this year, throwing 23 2/3 innings and allowing just three earned runs although he’s allowed 29 runners (including two home runs) on 17 hits and 12 walks. Top-5 prospect Daniel Norris goes for the Blue Jays and looks to continue his early dominance through 2014. Catch the game at 6:30pm. The Lugnuts go for four wins in a row against the Lake County Captains. The Captains have Mitch Brown, 20, on the mound against Kendall Graveman for the Lugnuts. Brown has struggled somewhat with a 5.40 ERA and eight walks in 11 2/3 innings (with eight strikeouts). Graveman, on the other hand, is coming off a near no hitter in Beloit and a Midwest League pitcher of the week award. Graveman, in his second go-round with the Lugnuts, has a 0.44 ERA and has allowed only eight hits and four walks through 20 1/3 innings with 18 strikeouts. Catch the action at 7pm online or on the radio.